Both the adaptive icons and use of the Data Backup API are only really visible through the lens of a teardown, and frankly, there's not much to say about them. Simply put, Play Games is now caught up on both of those for the respective OS versions in which they were introduced. The single most significant enhancement is the addition of a half dozen notification channels. For users on Android O, it's now possible to control the priority and options of notifications from Play Games, including: multiplayer notifications, invitations from unknown players, gifts and requests, quests, level-up notifications, and gameplay video recordings. The app resources have also been cleaned up significantly, reducing the total size by about 15%. 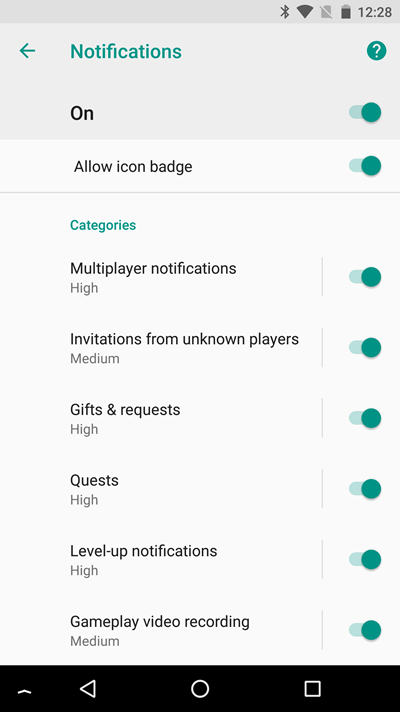 And finally, it might not come as much of a surprise after Gingerbread support was dropped from Google Play services earlier this year, but the new version of Play Games (based on the one variant we have so far) makes it look like the minimum API level may have been raised to Android 4.0 Ice Cream Sandwich. Seeing as Gingerbread accounts for less than 1% of the devices still in use, that's probably not going to impact very many people anymore. Besides, the old version should continue working for those that are using it.